Thanks to funding from Granville Island, we are setting up a wonderful free afternoon of programming at a new venue on The Island. It should be quite the festive occasion ... mark it in your social calendar and bring along the whole family. It all happens at the Chain and Forge on Granville Island. It'll be a day of hot music, cold beer, fab food, and general merriment. 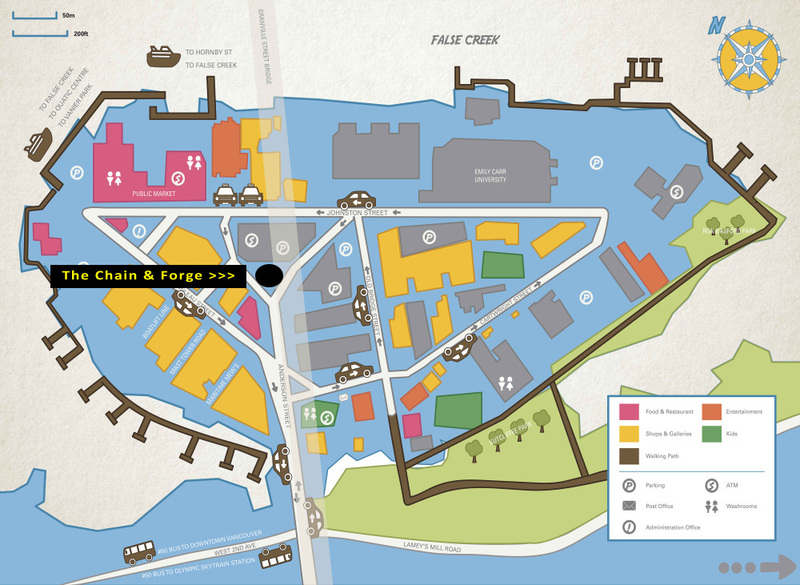 The Chain and Forge is located at the point where Anderson Street (East) and Anderson Street (West) meet. The Keg is just to the west of the site. To see this on a map, please go here. This is your opportunity to learn the ins and outs of bluegrass jamming in a very supportive atmosphere with a fantastic group of players. It's geared for beginners, but more advanced pickers find it a great way to practice new licks at a slower speed. It's also a wonderful way to learn new songs and meet other bluegrass lovers. Sue has been leading jams for many years now, and knows just how to make it all fun and stress-free. All acoustic instruments are welcome. You should have some experience playing your instrument at the beginner level, be able to tune your guitar and play basic chords. Join Sue and her band to learn bluegrass the Slow Pitch Way! The Rocket Revellers are the house band at Gastown’s Revel Room. Lead vocalist Dennis Brock had his beginnings in the San Francisco rock & roll Group Skin N Bones. He shifted to a more blues and swing style after recording at Sun Studios in Memphis with his group Denny & the Magnets. Dennis’s vocal style has evolved to include roots, gospel, and swing standards. The Revellers came together organically as a group in 2012 after many jams together and play a mixture of Texas swing, roots, & rockabilly. Other members include Jimmy Roy on lap steel, boogie woogie legend Michael Van Eyes on piano, Patrick Metzger on upright bass and James “Hollywood” Badger on drums. These folks can rip it up bluegrass style with sweet n' crunchy harmonies and tight melodic breaks that'll make your heart soar, your feet shuffle and your blood curdle! Canadian roots and the traditions of American bluegrass, Métis, country, rockabilly and old-time have influenced their ever evolving style. The songs reflect Canadian landscape and experiences and the result is entirely natural, effortless and delightfully original. Viper Central is an acoustic string-band that takes that 'high lonesome sound' to new places. At the forefront of a rising wave of new local talent in the bluegrass and old-time music genres, Viper Central has managed to create an original niche in an otherwise traditional style and yet simultaneously appeal to audiences both young and old. Hailing from the Republic of East Vancouver, they approach their music with the sense of creativity and adventure found in the earliest bluegrass and old time recordings. While all members contribute original songs, the band won't hesitate to deliver their take on an ages-old mournful waltz or bring the house down with a barn-burning bluegrass standard. Van Django is an acoustic string ensemble made up of four of Canada's most talented and eclectic musicians; violinist Cameron Wilson, guitarist Budge Schachte, guitarist/cellist Finn Manniche and bassist Brent Gubbels. Van Django's music is well-rooted in the gypsy jazz of 1930's Paris France, but beyond that it's all pure blue-skying; flights of dazzling fancy, driving rhythms and boundless creativity featuring original compositions and arrangements including humorous mash-ups that showcase their eclectic influences in full regalia. Perhaps Nick Lehr, director of Djangofest Northwest, summed it up best describing Van Django when he said: "In an increasingly crowded niche, Van Django is a standout act. With a clever mix of contemporary standards, classical ditties, rock homages and solid originals they effortlessly whip the audience into a joyful frenzy. Attending a Van Django concert is the most fun you can have sitting down with your clothes on." Granville Island's Activation Grants and Initiatives.